Mike Mulligan Saves the Day… It’s What He Does. First off, the Safety Supervisor came home this past Friday and resumed his position. He is doing much better and is taking it easy until he can have surgery to remove the gallbladder in a few weeks. The latest safety summit focused on keeping warm in the winter workplace. Because of the drop in temperature, we had to postpone the siding so we could work on getting the slab in before the frost. We started with the funny corner fence posts, called batter boards, which we have Mike Mulligan to thank for. Sure, I read Mike Mulligan and His Steam Shovel when I was little but it wasn’t one of my faves; I much preferred Katy and the Big Snow! However, the book apparently resonated with another member of the crew… Dad told me that is where he first learned how to lay out foundations. What kid picks up on that and files it away for later?! Well, I’m glad he’s the one doing the thinking because I didn’t have a clue where to begin. We took down the staging brackets and made a box, the width and length of my house, from the staging planks. We drove stakes in the ground so they were level all the way around and then we dug around and inside the box until it sank down to the level of the stakes. The perimeter was a foot deep and the middle of the box was 4″. Mom was helping us with the shoveling but took breaks to get pictures. 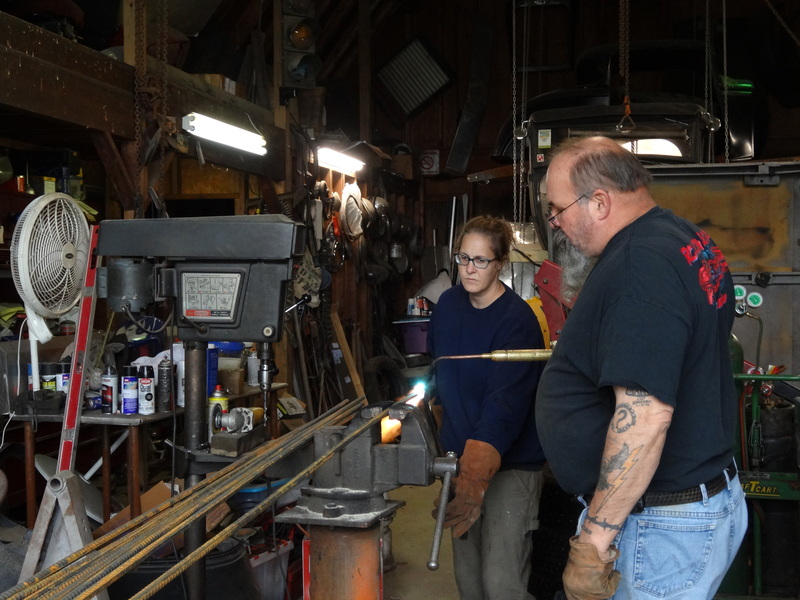 Next, we bent the rebar to make the framework. Dad put a pipe in the square tubing I was using to bend the rebar so it stopped at the same spot each time and was uniform. Mom and I tied the rebar while dad welded the eyes we are going to use to tie down my trailer to the foundation. Tying rebar… it’s what we do. We screed (another new term I learned) the concrete, which was slightly difficult around the eyes and boxes. Dad finally explained how the boxes work… We will be cutting them out and the lip I added around the edge will have made an indent that we can rest covers on for the pipes if the pad is ever left exposed. Later in the week, mom and I dug around the box and dismantled it, and I packed the dirt back in. 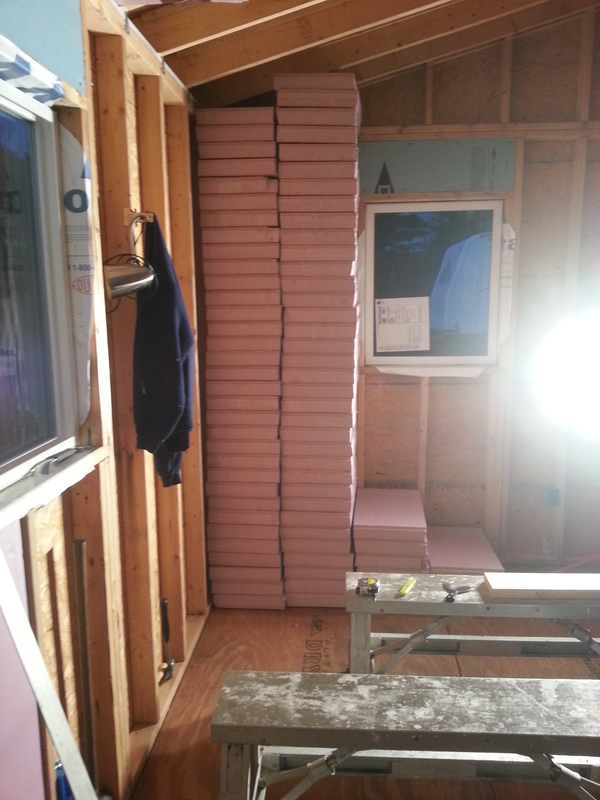 I cut all the insulation for the ceiling and am ready to put it up. I also started preparing for the plumbing before dad got home but just ended up making a lot of unnecessary work for myself and, well, I don’t want to talk about it… Dad welded in the triangle pieces of steel that we had made templates for so long ago to strengthen the tongue. We did get around to laying the PEX but I’ll cover that in a new post, once I get more pics of it. In Webster’s, this effort should be under the word impressive!….Veeeerrrrrrryyyy!!…Mr. Weatherman, please hold off on any further components of the impending winter season! Aw, shucks… And, amen about the weather!